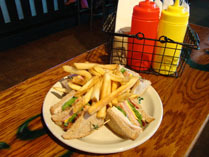 If you read our last review of Mr. Ed's (click here), you know that this is one of our favorite hangouts on Put-in-Bay. So it was with mild trepidation that we heard that they had completely remodeled their menu for this year and invited us in for lunch. We were lucky to show up the day they were practicing and finalizing their new menu items and got an insider peek at the new food. We've never left hungry before, and this trip was no exception! The burger section of the menu is almost completely new. The theme this year is based around their Big Chubby burger. This is the platform for all of the other burger creations, of which there are many. Offerings this year range from adding pulled pork, to bologna, to onion rings, to chorizo. We decided to try the chorizo burger. 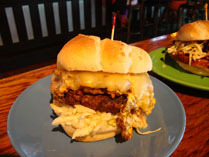 It's official name is "The Spanish Sunrise Burger" and you may ask why such a goofy name. Chorizo (spanish) and a fried egg (sunrise) are featured, so it makes more sense after you see it. Back to the beginning... this is your platform Big Chubby burger to which they have added chorizo, albeit not a super spicy blend. It is all about the chorizo flavor and not the heat, fortunately (tastes great!) and unfortunately (I like it hot hot hot!). The burger is topped with some pepper jack cheese and a fried egg on top of that to get the cheese melty. Top this off with some spicy slaw, green chilis, and southwest sauce and you have your burger! It's a little pricey at $11.49 but trust me, it's well worth it. Next up was the Killer Club ($8.99). This baby was stacked high with all sorts of goodies... turkey, ham, bacon, Swiss cheese, American cheese, lettuce, tomato... all squeezed in between 3 slices of wheat bread. Club sandwiches are a classic staple of country clubs and restaurants across the country. Heck, this esteemed reviewer grew up eating them with his grandma on Sunday afternoons at the Bloomfield Hills Country Club and lazy drunken afternoons in Las Vegas. I know my clubs! This one is pretty good. It won't take you outside, kick you in the pants, and make you go wow... but it will fill you up and not leave you hungry, and that is important. There is a fine line in this gastronomic life between the horrendously expensive cost of food-industry bacon, and putting enough on a sandwich to satisfy our bacon-loving public. Personal opinion... this club could use more bacon! That's about the only demerit we can give since it was so abundant in other ingredients. Would go great with soup! The manager explained the next dish to us and we had to argue about who was going to try it. This was the Pulled Pork Mac & Cheese ($8.99). Just the way it was described was enough to make us want to dig in. When it was served, it was a beauty to behold, a big bowl of white cheddar & shells style mac & cheese with a healthy portion of pulled pork on top. It may sound like an odd combination, but I dare you to try to put your fork down after having a bite. The sweet smokey meaty pork married perfectly to the creamy cheesey mac-n-cheese goodness. Truly something you would usually only see on "Diners, Drive-Ins, & Dives". The porky-cheese was so good, in fact, that those of us who didn't order it got a side order ($3.99) to munch on with our main meal!!! It was a perfect accompaniment to the burger and sandwiches that the rest of us ate. It was also a nice change of pace from the traditional french fries. I don't think any other restaurant on the island has a dish quite like this, so it is highly recommended to stop by Mr. Ed's and give it a try. If you don't like it, tell them to leave it in the kitchen for me to scarf up next time I'm in! 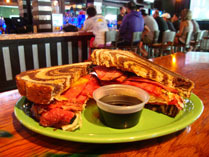 Another new offering at Mr. Ed's this year is the Pastrami & Rye Sandwich ($8.99). The pastrami is layered tall on marbled rye bread and just enough sliced gouda is on top to bring some flavor to the table. Layer on some slaw for a little crunch and you have yourself a delicious sandwich. Maybe it needs a little somethin-somethin to get it wet and add some zing you ask? No worries! The Crown Royal & Coke reduction dressing that is served on the side comes to the rescue. This isn't just a crown and coke splashed into a cup. No sir! This is actually a dressing. They start out back in the kitchen with a big pot of Coca-Cola that they heat up. This is brought up to temp and allowed to reduce down for a couple hours until it is syrupy and sweet and then the Crown is added to taste to give it that wonderful whiskey flavor. The result is a truly unique sauce that will take your pastrami dipping experience to a whole new level. Don't let your kiddies shoot this sauce! Unfortunately, they wouldn't let us try everything, so a return trip this summer just may be warranted, for professional blogging reasons of course! Long time visitors to the island will be pleasantly surprised when they discover the new menu at Mr. Ed's on their next trip. 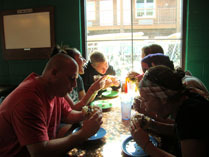 First time visitors will be wowwed by the level of food quality at what is at first blush a typical bar. The menu here is different than your usual boring island burger/sandwich menus that seem to pervade this island. Fresh thoughts, fresh food, and leaving with a freshly full tummy. Yumm! *SPECIAL NOTE* - Rumor has it they are doing a Bloody Mary Bar on early Saturday mornings (10am) that include screwdrivers and mimosas as well (now with Spicy Chorizo & Egg mini-burritos too). Check it out! You can reach Mr. Ed's Bar & Grille by calling 419.285.5042. You also can follow them online at http://www.mredsputinbay.com .